I’m a keen consumer of podcasts and as the Oscar nominations were released one of my favourite podcasts, Screen junkies Movie Fights debated who would win ‘best picture’ among other things. This is when The Revenant first appeared on my radar. My interest was instantly pricked partly due to the hardships Leonardo DiCaprio went through to make this movie and partly due to this movie being based on a true story. 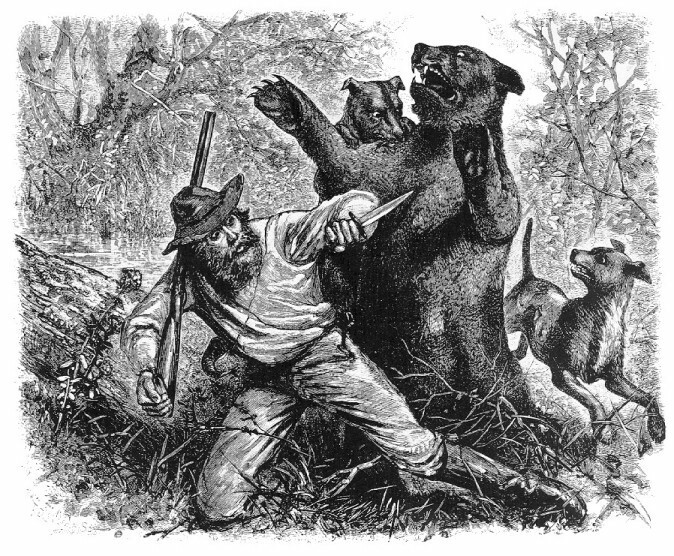 Illustration of Hugh Glass and his legendary bear attack published at the time for a newspaper. I managed to persuade my regular cinema buddies to come and see this movie at our local multiplex. I have to admit that despite it being a challenge at times I really enjoyed The Revenant. So what’s the movie about? Well it’s a movie based in part on a novel called The Revenant by Michael Punke, which in turn is inspired by the true story of frontiersman Hugh Glass. In brief Hugh Glass and other fur trappers are hunting pelts when they are attacked by Arikara Native Americans. Glass and other survivors flee on a boat. They continue their journey on foot to their outpost, Fort Kiowa. Glass is scouting ahead when he disturbs a grizzly bear and her cubs. The bear attacks him and leaves him presumably mortally wounded. Three people including Glass’s half Pawnee son Hawk stay behind to bury him when he dies. One of the men, Fitzgerald ends up killing Hawk and abandoning Glass. The remainder of the movie follows Glass as he battles to survive and make his way back to Fort Kiowa then seeks out Fitzgerald to extract his revenge.